But what makes Libby so cool is that she has used her love for baking as a way to raise money to bring clean water to a community in Africa. Muffin Mondays she calls them. 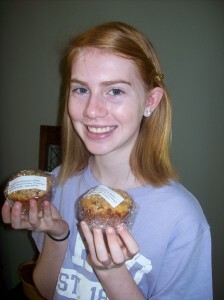 Every Monday since early October Libby has delivered freshly baked muffins to the Teacher’s Room at her school in Harrison. Flavors vary each week and have included Peanut Butter Chocolate Chip, Granola, Blueberry, and Cinnamon Apple Crumble. Wrapped in clear plastic wrap so the tantalizing goodness can be seen, each muffin is labeled with this equally clear message … these muffins don’t only taste good, they DO good. They taste good, and do good! Each muffin is only $1, but that $1 is a gateway to clean water. 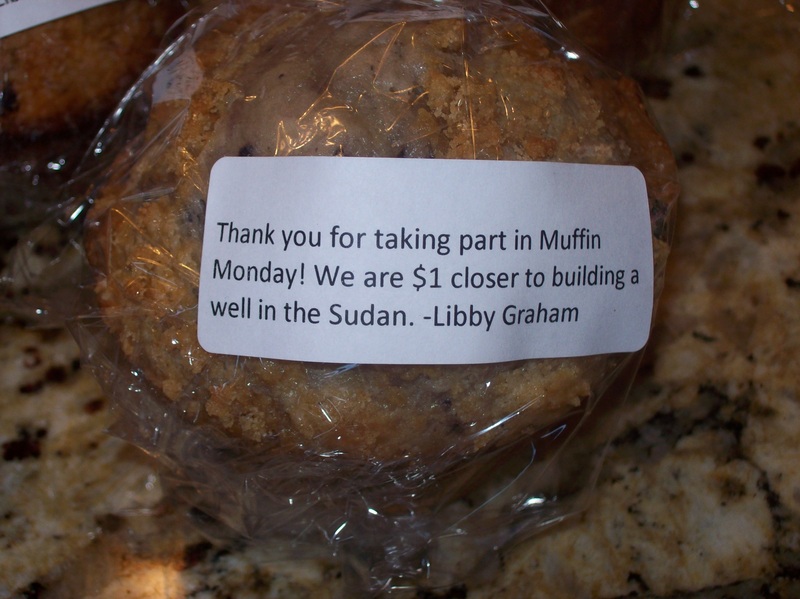 Libby’s loyal teachers and fans have been doing their part by ordering their muffins each week, and Libby and her family are gaining momentum toward their goal to fund a well. What about the rest of Libby’s family? Well, Dad holds the invaluable (and lucky) role of being an official taste tester; and sister Maggie is helping out in the kitchen measuring out yummy ingredients. The inspiration of all this family fun? Libby’s Grandmother, who has seen first-hand the need for clean water during mission trips to Africa. Her stories shared with Mother Meg and Granddaughter Libby stirred up the passion for clean water that led the Graham family to bake treats that will turn into taps (or more likely pumps) of clean water. So my only question? If Monday’s are for muffins, what about Tuesday and the rest of the week? !